There is hope in the media worldwide that Sepp Blatter's departure from Fifa will help cleanse football's governing body of corruption. But in Moscow there are suspicions that this is a disguised attack against Russia. True to form, state-run Rossiya 1 TV took a more conspiratorial tone. It described Mr Blatter as a "real friend of Russia" and suggested that this may be the real reason why he came under pressure. "Would European and North American football functionaries be thinking of moving the 2018 World Cup if it was not hosted by Russia?" the TV's reported asked. Unlike Russia, the media in Qatar are not speculating about whether they will still be allowed to host the World Cup in 2022. Two dailies - Al-Watan and Al-Rayah - carry only the local football federation chief's response to the call by the English Football Association's Greg Dyke for a probe. "Greg Dyke should focus on making sure his country's team qualifies for the 2022 finals, rather than being concerned about Qatar's hosting of the tournament," Sheikh Hamad Bin Khalifah Bin Ahmad is quoted as saying. Mr Blatter's resignation is news throughout the Middle East. Saudi Al-Riyadh is typical in running the front page headline: "Corruption storm uproots Blatter". Egypt's Al-Goumhouriya tells its readers simply: "Congratulations", but the Cairo daily Al-Akhbar argues that Mr Blatter's departure is "not enough unless corruption in the international organization is uprooted". In Mr Blatter's native Switzerland, Neue Zuercher Zeitung is glad that the "great survivor" is leaving: "The time for him to resign had already come at the end of his last term as president. But he clung to office." Germany's Frankfurter Allgemeine Zeitung wonders whether world football can avoid "falling into the hands of the next greedy autocrat". "The better future is still far from won, despite Blatter's resignation," it concludes. 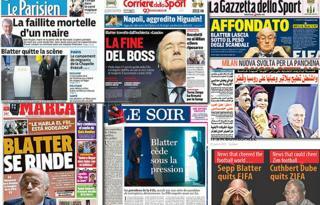 Italian newspapers have few kind words for the Fifa president. "Yesterday the US president went down in history as the head of government who changed the fate of world football by blowing up the fortress in which Sepp Blatter had imprisoned the most beautiful game in the world," says Corriere della Sera. In France, L'Express is also happy to see the back of Mr Blatter. "Sepp Blatter's resignation: 'A good afternoon for football'," says its headline. Brazilian newspaper Folha de Sao Paulo argues that Mr Blatter's departure will not be enough to cleanse Fifa of corruption completely: "It has removed the billy-goat from the room, but the institution that controls football still stinks, being full of other billy-goats just waiting for their misdeeds to be exposed," the paper says. Colombia's El Tiempo also calls for more action. It urges a maximum term for Fifa presidents "to avoid such long administrations (nearly life-terms) as those of Joao Havelange and Blatter himself". Uganda's Daily Monitor has some suggestions on how Fifa can "dig its name out of the hole" - "Get to the bottom of this matter. Once proven true, force culprits to return the money thereafter, relieve them of their jobs. Slap a lengthy ban on each giver of the money. Ask them to pay an equivalent amount as a fine. Only after this will the sports fraternity take Fifa seriously."